Apollo’s Hegemony Alpha GPC is a dietary supplement with a clinically-proven nootropic effect with as much as 99% of choline alfoscerate. Alpha GPC is a source of highly bioavailable choline. It has the ability to cross the blood-brain barrier, thanks to which it factually and effectively contributes to increased acetylcholine synthesis and supports the rebuilding of damaged nerve cells. That, in turn, translates into an improvement of cognitive functions. 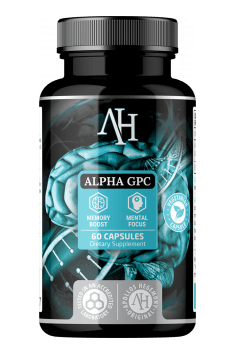 Numerous scientific studies have confirmed that alpha GPC has a beneficial effect on brain functioning, and, most importantly, it is safe and very well tolerated. The compound, an acetylcholine precursor, above all improves attention and concentration, the process of memorising, as well as helps to inhibit the occurrence of harmful neurodegenerative lesions connected with age, which are a reason for the worsening of cognitive functions. Moreover, thanks to its effect on the parasympathetic system, it can exhibit calming properties. Alpha-GPC (alpha-glycerylphosphorylcholine, choline alfoscerate) is a phospholipid that occurs physiologically in nerve tissue and contains choline. The compound performs the function of a substrate for one of the most important neurotransmitters in the organism: acetylcholine. Thanks to that, it effectively supports the functioning of the nervous system. Alpha GPC provides nerve cells with easily-assimilable choline, a substance later converted to acetylcholine. Choline does occur naturally in food; however, choline alfoscerate supplementation has been proven to be much more beneficial for and better tolerated by the organism. Additionally, choline participates in the synthesis of phospholipids constituting an element of cell membranes, thanks to which it increases their integrity and improves nerve impulse transmission. Acetylcholine is an ester of acetic acid and choline, and it constitutes a basic neurotransmitter of the cholinergic system, responsible for resting and normal digestive processes. The substance is responsible for transmitting nerve impulses and normal reception of stimuli from both external and internal environments; it also plays a crucial role in maintaining normal concentration and attention, in the process of learning, creating memory traces and their recalling. It has been observed that alpha GPC also affects the increase of GABA levels (γ-aminobutyric acid). GABA is the primary neurotransmitter of the central nervous system; it exhibits inhibitory properties that have such effects as, e.g., calming and stress-reducing ones. Alpha GPC can be an effective aid in Alzheimer’s disease therapy, as well as that of other neurodegenerative diseases, such as schizophrenia, anxiety, Parkinson’s disease. Many studies suggest that the diseases are linked with disorders of the GABAergic and cholinergic systems; their symptoms are, e.g., a drop in GABA levels in the brain, as well as reduced choline uptake and acetylcholine synthesis. To sum up, Alpha GPC is one of the best supplements for increasing choline levels in the plasma and in the brain. Because of its beneficial effect on acetylcholine production and protection of cell membranes, it proves an efficient agent for aiding information assimilation, improving learning processes, as well as concentration and the ability to focus, which can prove particularly useful during, e.g., exam sessions or other situations that require similarly intensive intellectual activity. Moreover, the product activates the parasympathetic system, to which it owes its calming effect. It is an additional edge, especially in the case of stress and intensive intellectual activity. The supplement is also recommended for elderly people, prone to neurodegenerative disorders, as an aiding agent in preventing memory loss and deterioration of cognitive functions, as well as for other people, struggling with low concentration and reduced ability to learn efficiently. Brałem hupercynę solo, alpha gpc solo - oba produkty dobrze na mnie działały. Poczytałem jednak trochę opinii i zdecydowałem się połączyć je ze sobą. Hupercyna i A-GPC bardzo dobrze się ze sobą uzupełniają. Na prawdę świetny stack - koncentracja, jasność umysłu i poprawa humoru. podstawowy środek w każdym moim nootropowym stacku. Cena/jakość najlepsza na polskim rynku. Świetny produkt. Wcześniej stosowałem dwuwinian i też byłem zadowolony, jednak wolałem coś w formie kapsułek. Alpha GPC pozwala praktycznie odrazu wskoczyć na obroty, bez tego 'rozkręcania się' :) lepiej się koncentruję na danej czynności, po prostu myśli się 'łatwiej'. Spróbuję połączyć z hupercyna. Polecam, naprawdę warto! tak jak jedna osoba zauważyła alpha gpc 'lubi' się z hupercyną co czyni to dobrym połączeniem. Ode 5/5 bo to na pewno najbardziej opłacalna ALPhA GPC na rynku. Odkąd spróbowałam to nie wyobrażam sobie podstawowej suplementacji bez GPC i Huperziny! Take 2 capsules twice daily with food. Best when taken early in the day. Alpha GPC is an effective and quite universal product, which may be used in many ways. As choline supplementation, which is supposed to be a substrate to acetylcholine production and improve cognitive functions, even one capsule used two times a day should be sufficient. The same dose should be effective to support the activity of recetams and noopept, although in this case the dose may be optionally doubled or 1-2 capsules of the above mentioned products per each portion may be used, when we use them only temporarily. In order to improve training quality and increase growth hormone production, it is worth taking 2 capsules (or even 3) before the planned training. Alpha GPC is a safe preparation and there is no recommended time of application. Cellulose - capsule shell, maltodextrin. Probiotic complex providing 8 bacterial strains with a total of 10 billion capsules.